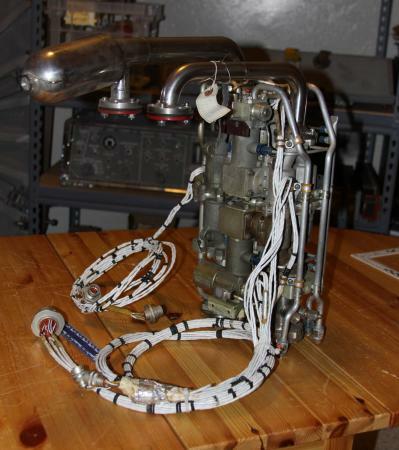 An Apollo Lunar Module Ascent Engine Valve Package Assembly (VPA) produced by Bell Aerospace Corporation under NASA contract NAS9-1100 for Grumman (Prime for the LM). This assembly regulated propellant flow into the engine injectors and combustion chamber of the engine; it had to function perfectly the first and only time it was employed or the crew would have perished on the surface of the moon. The VPA accepted hypergolic fuel (hydrazine (N2H4) mixed with unsymmetrical dimethylhydrazine (UDMH), commercially known as Aerozine 50, and oxidizer (nitrogen tetroxide - N2O4) from the Ascent stage propellant storage tanks; supplying it to the propellant feed section/engine assembly interface, the oxidizer and fuel lines lead into the valve package assembly. The individual valves that make up the valve package assembly are in a series-parallel arrangement to provide redundant propellant flow paths and shutoff capability. The valve package assembly consists of eight propellant shutoff valves and four solenoid-operated pilot valve and actuator assemblies. valve assembly consists of one fuel shutoff valve and one oxidizer shutoff valve These are ball valves that are operated by a common shaft. which is connected to its respective pilot valve and actuator assembly. Shaft seals and vented cavities prevent the propellants from coming into contact with each other. The VPA was also connected to separate vent manifold assemblies which drained the fuel and oxidizer that leaks past the valve seals, and the actuation fluid (fuel in the actuators when the pilot valves close), overboard. The eight shutoff valves open simultaneously to permit propellant flow to the engine while it is operating; they close simultaneously to terminate propellant flow at engine shutdown. The four non-latching, solenoid-operated pilot valves control the actuation fluid (fuel). Notice the fuel ducting appears larger, bulboelous then its companion oxidizer line. During testing of the Ascent engine it was noticed that pre-ignition pressure spikes were occurring, this was resolved by lengthening the path the fuel had to take so that timing of its arrival at the injector was delayed to occur until slightly after the oxidizer (the ducting wraps back on itself to extend the path length).